We last left you as we made our journey towards the big bright lights of Edinburgh. Whatever happened we hear you ask?? We were welcomed immediately by Ali (an Otesha alumni) and her other wonderful housemates. We rejoiced in sharing their very cosy house with them and pitched our tents in a higgildy-piggildy fashion in their garden. By the end of our stay most of us had migrated inside with our sleeping bags because of everyone’s generosity. We also enjoyed the rare luxuries: a stove, oven and easy access to a well needed shower. We had traveled to Edinburgh as the Fringe festival was dominating the city, and the highlight of our agenda was that we were going to have our debut performance on the Royal Mile. This prospect began to fill us all with excitement and fear and we got on with rehearsals, occasionally interrupted with thunderstorms and hail. Staying with Ali meant we were a short cycle ride away from the city centre so on the day of our first performance we donned our Otesha t-shirts and cycled into town, a tangible feeling of being a part of something bigger struck the group. The Royal Mile was bustling with performers all strutting their stuff and working hard to keep a crowd. We found our spot, did a classic Otesha energiser (the banana game!!) and started the day. Our energy was fantastic but given the setting we found we had passers-by strolling right through Gilly’s bedroom. We set to work on adapting the play to make it a bit more Fringe friendly. We found help with this challenge from a surprise source – Ben- a friend of a housemate was keen to get involved and debuted his song ‘we’re all gonna die’. Some were dubious at first but the whole group became enthusiastic to the irony and we invited Ben to join our play and bring his musical talent. Ben also brought the rain; the next day the rain poured down. But in true Tartan trail fashion we sang, acted and danced through it, having an amazing uplifting time. We grabbed our free time where we found it and ventured out to see what else the Fringe had to offer. We found comedy, street performance and free events. Somehow we found time to also visit a city farm, a stark contrast to Whitmuir’s values and approach to farming. The city farm’s main purpose is to allow diverse groups to see animals in their environment. We left Edinburgh with a fond farewell to our hosts, armed with an amazing herbal first aid kit from Ali, almost taking one of them with us for a jolly. We traveled over the Forth bridge and to new ventures. We spent our next night at the Ecology Centre and Earthship at Kinghorn Loch. Our home for the night was a yurt! A new experience for many of the group. The Ecology Centre was a project originally set up to engage young people with their environment, run by voluntary members of the local community. The earthship itself was the first of its kind in the UK, made from tyres to be super insulated, running on solar gain (no heating needed) and renewable energy. Trailer Punctures: 4… the thorns got us good. Last Tuesday morning the entire Northern Soul team wriggled out of a tiny two-man tent to find 100 primary school children sitting in neat rows (this may have been planned). It was one of many great visits to schools over the past couple of weeks. The performances and workshops always remind us why we’re on tour. The children’s and teachers’ laughs make the performances so much fun, and their ideas and initiatives inspire fantastic conversations during workshops. Although the funniest part of the play for the children is repeatedly a tree in the Amazon being cut down, interactions with the children after the play and during workshops assure us that they are really engaging with issues of sustainability. The only thing children don’t like about our Fairtrade workshop is the reality that many people in the production chain of a non-fairtrade banana don’t get paid fairly! Children have told us about significant changes they will make in their (and their families’) transport choices; they’ve also told us (half-way through a workshop) that they’ve just used less toilet paper! It’s great to see so many projects going on in schools already, led by students and teachers alike. From gardening projects to bike-ability classes, and keeping chickens to composting, the schools really impressed us with their knowledge, motivation, and desire to learn and share with us. We’ve experienced such wonderful hospitality from schools: from donuts for breakfast, to moving meetings for us to use their staff room, to letting us camp in the school hall or field, and even gifts of Fairtrade chocolate, juice and oatmilk. These school visits along with the hospitality from all our other wonderful hosts has given us new faith and hope in humanity. 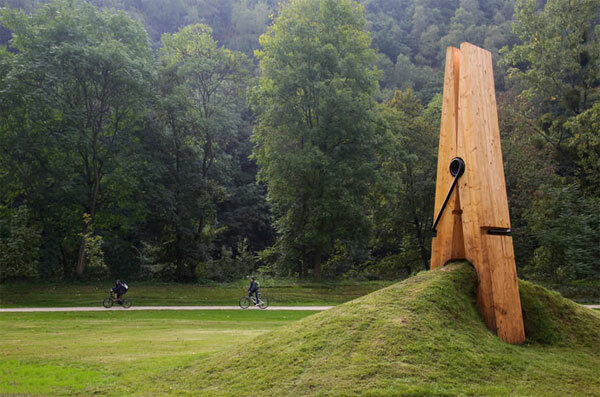 Is this giant clothes peg real? Does it matter? Twee is all I need sometimes. In the spirit of twee I’ve been making baskets out of some pretty old welsh maps that my housemates found through freecycle (join up to your local group here) using these instructions. I didn’t have a craft knife or mat and found that, contrary to the instructions, scissors were fine (all you need is: paper, scissors, ruler and some thread/string. Sorted). Good for bike bits. Good for giving as present. I find that the old wallpaper I got from a charity shop works well too. When it comes to crafting, making, fixing, the internet is your (ethically caught) oyster! The incredible website instructables will tell you have to make just about anything yourself from food, to fashion, to furniture. Go forth with thy search engine and craft! I felt inspired by the Otesha HQ’s car park garden so for my next act of twee I will be planting garlic bulbs in old colourful shoes that are beyond repair (plantable now and foolproof, apparently) to brighten up my concrete back yard.